Hello lovelies and how is everyone today? I did miss you guys on Monday but since it was the long weekend here in Canada, it was good to just kick back and spend less time online than usual. I have an extremely bad habit of always being online; if not on my MacBook then I would be on my iPhone. It's horrid but I'm trying to be better at it and it felt good to not being glued to my Macbook all day long this weekend. 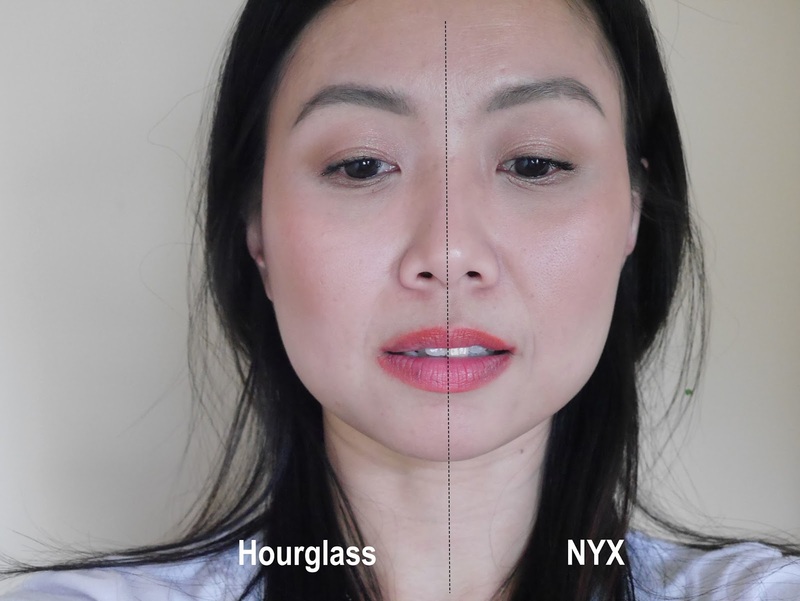 As you can already judge by the title, this was the post that some of you have been waiting for; NYX Angel Veil Primer (check here) vs Hourglass Veil Mineral Primer (check here). If you scoured the internet then you will come across plenty of posts which did the same comparison so I'll be upfront that both primers are not new in the market, this comparison is also not new nor original and truthfully, I purchased Hourglass Veil Mineral Primer (check here) strictly for this post as I would have never picked this up for myself. It's pricey, actually make that freaking pricey but is it worth the money? Is NYX Angel Veil Primer a good dupe for it? If you want to find out then read on. ~ Titanium Dioxide 2.45%: Reflects UVA/UVB rays to protect skin from harmful damage and are an alternative to chemical-based sunscreen agents. ~ Zinc Oxide 4.20%: Provides anti-inflammatory properties and offers full spectrum coverage by absorbing UVA and UVB rays at the skin's surface. Cyclopentasiloxane, Isododecane, Polysilicone-11, Polymethylsilsesquioxane, Hexyl Laurate, Peg-10 Dimethicone, Polyglyceryl-4 Isosterate, Stearic Acid, Alumina. NYX Angel Veil Primer comes in a white tube while Hourglass Veil Mineral Primer comes in a fancy frosted glass bottle with a pump. Frankly, I actually prefer NYX packaging because it's so much easier for me to control the amount that I need whereas I find it harder with the pump. I use less than one pump each time and I personally find it hard to know how hard/soft I need to press the pump. Hourglass spreads smooth whereas NYX doesn't. 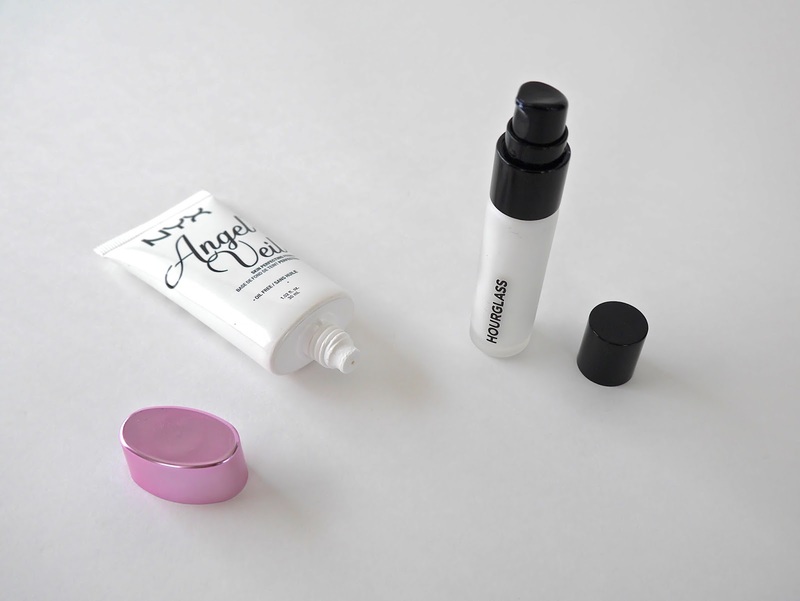 Both dispense as stark white lotion however NYX Angel Veil Primer has a thicker texture than Hourglass. 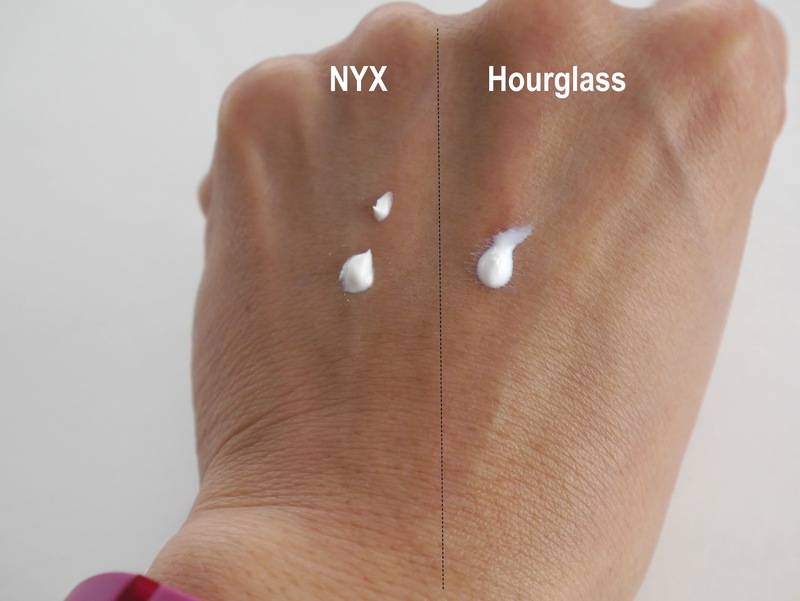 As you spread both onto the skin, you will instantly notice the differences between both, NYX doesn't spread as smoothly whereas Hourglass feels smoother than butter. And because NYX doesn't spread through the skin as easily, I find that I need more product to cover the same area in comparison to Hourglass. 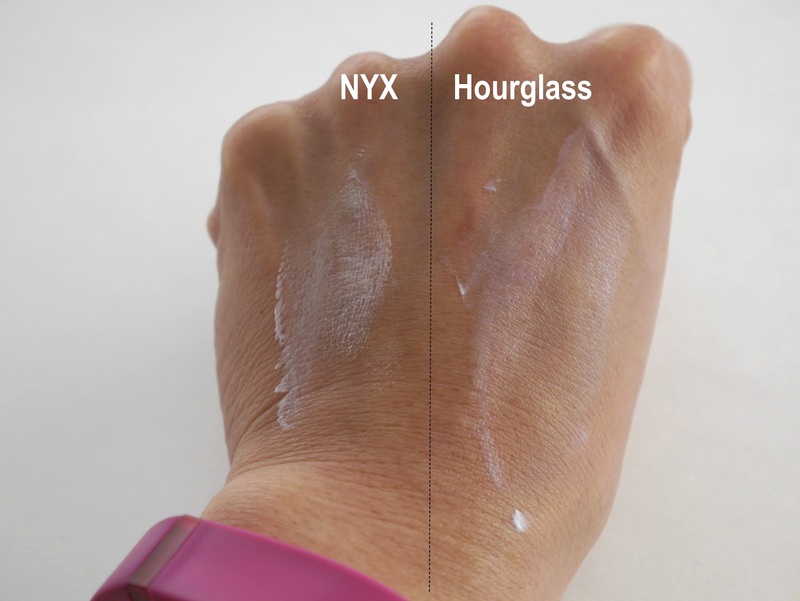 Another huge difference is NYX will leave a slight white cast on the skin while Hourglass is invisible on the skin. I am medium skin tone and depending on the amount I apply, I can see the white cast from NYX Angel Veil Primer so I think darker skin lovelies will have a harder time with it. Another thing to note, NYX Angel Veil Primer has the tendency to separate in the tube so it's best to shake it really well before dispensing product. Now this is where it gets interesting. Both offer the same soft focus effect on the skin, blurring out pores, softening the lines and leaving my skin looking matte-ish however, in reality Hourglass does give a luminosity to my skin that the camera failed to pick up. My foundation slides equally easy on both sides of my face and there are no differences between both at all. One thing to note, Hourglass Veil Mineral Primer has SPF15 while NYX Angel Veil Primer doesn't so you do get a tiny weeny sun protection with Hourglass. However, the interesting part is at the end of the day, you will notice the differences between both primers. After 8 hours wear with me cleaning, cooking and being outside with little tyke, you can clearly see how each performs in the picture below. While the side of my face with Hourglass still looks as good as when I first applied in the morning with my pores and lines still blurred, the NYX side has started to look a touch shiny, my pores are no longer blurred and my blusher has faded a little. 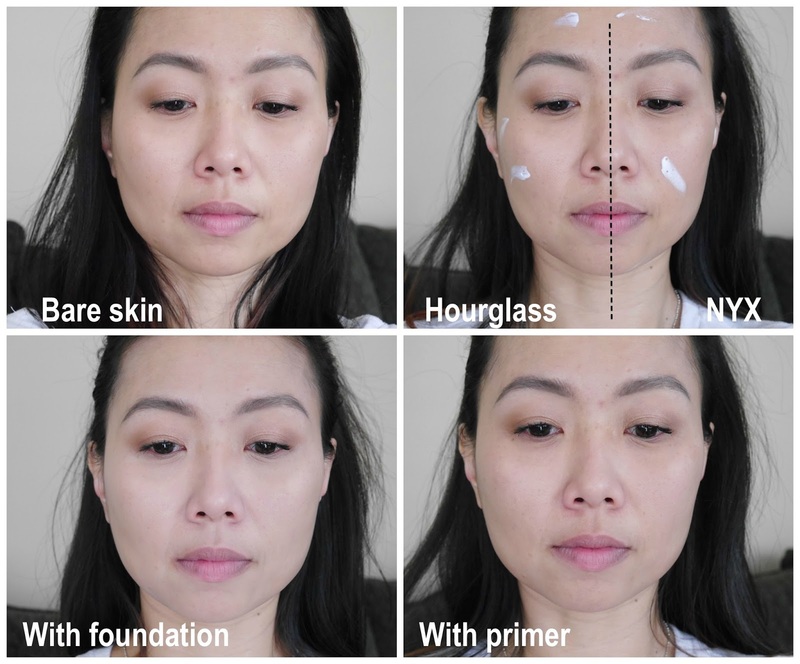 So is NYX Angel Veil Primer (check here) a good dupe for Hourglass Veil Mineral Primer (check here)? I personally think it's a good option if you don't want to pay the high price for Hourglass but it's not an almost spot on dupe as many claim or at least it's not on my skin. It's also hard for me to say it's a 80% or 75% dupe as I personally think there's a lot of differences. I know the differences are minimal for some but for me the differences in texture, longevity, performance between both are pretty obvious. I hate saying this but Hourglass (check here) wins this battle for me and I seriously love how smooth and perfect it makes my skin look. My skin looks really alive and luminous with it, something that NYX (check here) failed to offer. This tiny bottle will last me easily a few months as I need extremely little each time but I do plan to pick up the 1oz bottle once this runs out. Have you tried either primer before? What are your thoughts?